Eid Al-Fitr – also known as Eid Al-Saghir (the small eid) – concludes a full month of fasting in Ramadan. Any of these recipes might be served in Morocco on this festive day. 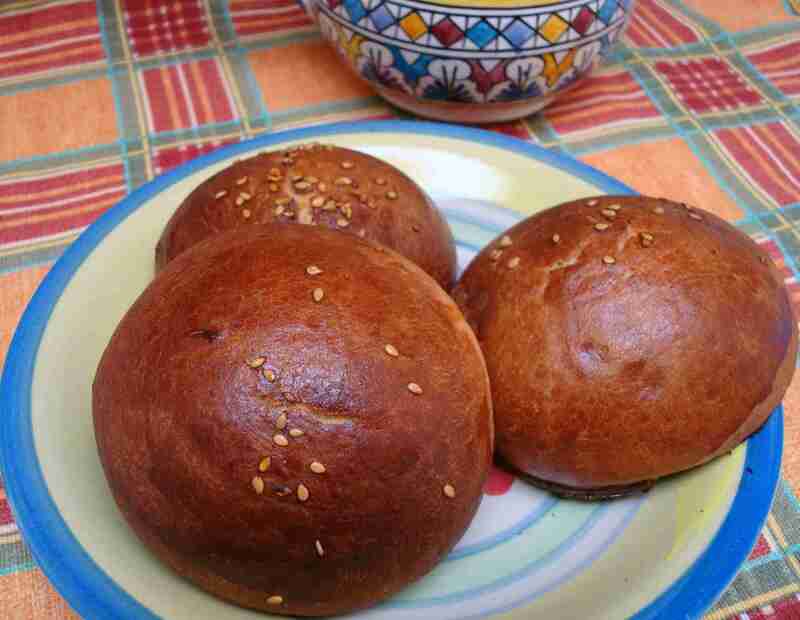 Anise seeds, sesame seeds, and orange flower water give these sweet rolls their fragrant, characteristic flavor. They're served at tea time or for breakfast. These square-shaped pancakes are made by flattening dough until it's paper-thin ​and then folding it into square layers. It's delicious plain or dipped in syrup made from melted butter and honey. Meloui are round Moroccan pancakes (rghaif) that are shaped by rolling a folded strip of dough up like a rug and then flattening the upright coil into a circle. They can be eaten plain or with syrup made from butter and honey. Beghrir are tender Moroccan pancakes made from semolina. Yeast in the crepe-like batter causes hundreds of bubbles to form and break on the surface of the pancake as it cooks. Even Morocco has a version of beignets, a French term adopted by many cultures to refer to sweet, yeast-risen fried dough. This gorgeous presentation of Moroccan salads is traditionally served as a starter course when hosting an honored guest, entertaining a group of people, or celebrating a special occasion. This popular rice and tuna salad goes well with almost any fish, chicken, or meat dinner. Vary the salad by adding different vegetables for color and texture. Mechoui is traditionally prepared by roasting a whole lamb either on a spit over a fire or in a pit in the ground. The meat is eaten by hand with salt and cumin for dipping. This mechoui recipe calls for very slowly roasting a leg of lamb or shoulder in the oven until the meat is tender enough to pull off the bone. Simple, easy and delicious! Chicken Bastilla is Morocco's famous chicken pie and a great do-ahead dish for any special occasion. A light, crispy pastry shell conceals savory saffron chicken, spicy omelet stuffing, and crunchy topping of fried almonds sweetened and flavored with orange flower water. Spicy, savory and delicious, this seafood version of bastilla is another do-ahead dish ideal for busy holidays. Swordfish, shrimp, and calamari are mixed with rice vermicelli, black mushrooms, and a spicy tomato sauce. The filling is enclosed in paper-thin warqa or phyllo dough and then baked. Beef or lamb with prunes is a classic Moroccan dish that combines sweet prunes and meat with the fragrant spices of ginger, saffron, cinnamon, and pepper. It's often served at holiday gatherings, weddings and other special occasions with crusty bread for scooping up the meat and sauce. This sweet and spicy tagine is a savory combination of dried apricots and meat stewed with saffron, cinnamon, ginger, and pepper. Fried almonds are scattered over the tagine as a garnish. Delicious and easy to make, it's a classic Moroccan recipe which works equally well as a family dinner or special occasion meal. Tender, flavorful cuts of meat work best for these easy, tasty kebabs. Try using leg of lamb or beef steak fillets. Use either chicken or lamb in this Moroccan recipe for Couscous Tfaya. Tfaya refers to the sweet and spicy caramelized onions and raisins served with this dish. Some versions include chickpeas. In this classic recipe, steamed couscous is piled high with stewed meat and vegetables – very delicious! Meat with Olives and Preserved Lemons is a classic Moroccan dish flavored with onion, ginger, saffron, olives, and preserved lemons. Chicken with Preserved Lemon and Olives is a classic Moroccan dish. The roasting method calls for marinating whole chickens with a Moroccan spice rub and then slow-roasting the chickens the next day. Chicken Rfissa Medhoussa (also spelled rfisa and rafisa) is a Moroccan chicken and lentil dish that's served on a bed of shredded msemen, meloui or day old bread. The blend of Ras El Hanout, fenugreek seeds (helba in Arabic), saffron and other seasonings makes a truly unique and delicious dish. This easy Moroccan tagine features meat cooked until tender with saffron, ginger, and pepper, and then topped by soft dates in a cinnamon-flavored syrup. Sesame seeds and fried almonds are traditional garnishes. This dish is particularly delicious when prepared in a clay or ceramic tagine with a free-range chicken, often served by Moroccans for special occasions or honored guests. Although well-seasoned, the dish is not spicy and won't overshadow the prized flavor of the free range bird. The onions, some of which caramelize during cooking, add a subtle sweetness. Regular chicken can, of course, be used. Sliced oranges are served with a generous sprinkling of ground cinnamon, sugar and orange flower water. Serve this classic Moroccan dessert as a perfect ending to family meals and company dinners. These French treats are very popular in Morocco as breakfast or tea time fare. Plain croissants are stuffed with a rich almond cream filling. The croissants are dipped in a light syrup, topped with a little more of the filling, and then baked.